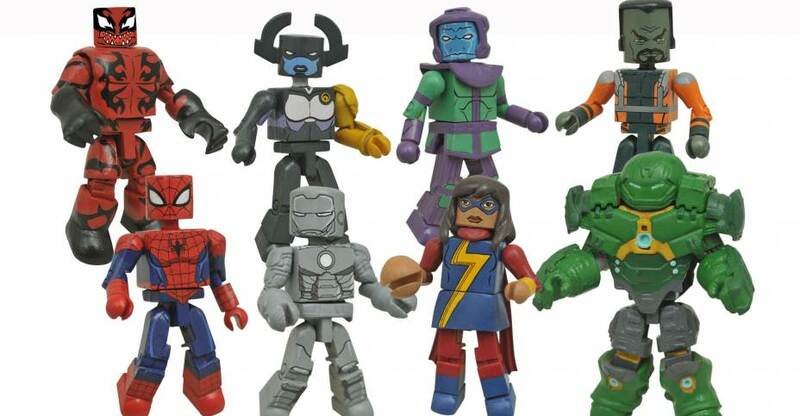 Diamond Select Toys recently released Series 4 of its Marvel Animated Minimates collection, the latest assortment in an exclusive mini-figure line only available at Walgreens stores. Now they’re ready to unveil the next assortment in the line! This upcoming fifth series of figures features all-new two-packs from Marvel’s Ultimate Spider-Man and Avengers Assemble, including new variations on your favorite Super Heroes and Super Villains, as well as two never-before-made characters! From Marvel’s Ultimate Spider-Man, Spider-Girl faces off with Hulk Carnage! May “Mayday” Parker is the daughter of Peter Parker from an alternate Earth, while a Carnage-possessed Hulk ravaged New York City in “The Symbiote Saga.” Spider-Girl includes a webline accessory. Also from Marvel’s Ultimate Spider-Man, Ms. Marvel battles Kang the Conqueror! Teenage Inhuman superheroine Kamala Khan comes with an interchangeable stretching arm and giant hand to challenge the master of time himself! This is the first Marvel Minimate of the new Ms. Marvel! From Marvel’s Avengers Assemble, Iron Man’s Mark II armor goes up against Proxima Midnight, a super-strong lieutenant of Thanos. Iron Man eatures a removable helmet and flight stand, while Proxima comes with her spear. This is the first Marvel Minimate of Proxima Midnight! Also from Marvel’s Avengers Assemble, Bruce Banner puts on his very own Hulkbuster Armor to take on the gamma-irradiated genius The Leader! The Hulkbuster Armor is removable, and Bruce includes alternate parts so you can display him in his Stark Industries T-shirt! Look for Series 5 to arrive in all Walgreens stores on July 1, 2017. Series 4 is in stores now, with Deep Immersion Spider-Man and Anti-Venom, Green Goblin with Scarlet Spider, Speed Energy Hulk with Speed Demon, and Iron Skull with Doctor Spectrum! Find your nearest store at Walgreens.com! 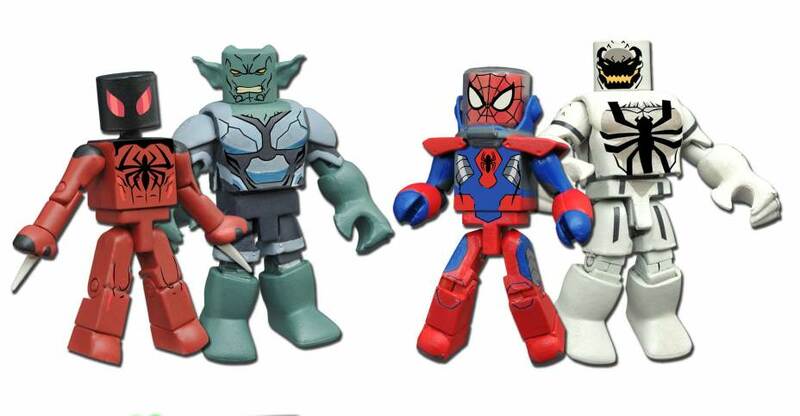 Diamond Select Toys recently released Series 3 of its Marvel Animated Minimates collection, the latest assortment in an exclusive mini-figure line only available at Walgreens stores. Now they’re ready to officially announce the next assortment in the line! This upcoming fourth series of figures features all-new two-packs from Marvel’s Ultimate Spider-Man and Avengers Assemble, including new variations on your favorite Super Heroes and five new Super Villains! From Marvel’s Ultimate Spider-Man, Deep Immersion Spider-Man faces off with Anti-Venom! Spider-Man wears the suit he wears for underwater and outer space missions, with a removable dome helmet. Also from Marvel’s Ultimate Spider-Man, the Scarlet Spider goes up against the Green Goblin! Spider-Man’s clone comes with a web line, plus two interchangeable hands with stingers extended. From Marvel’s Avengers Assemble, Speed Force Hulk chases down Speed Demon. This Hulk figure glows in the dark, to mimic the episode when he absorbed speed energy from the super-fast Squadron Supreme member. This is the first Marvel Minimate ever made of Speed Demon. Also from Marvel’s Avengers Assemble, the Iron Skull (a.k.a. the Red Skull in stolen Iron Man armor) teams up with the last member of the Squadron Supreme, Doctor Spectrum. This is the first Marvel Minimate ever made of Doctor Spectrum! Look for Series 4 to arrive in all Walgreens stores in Spring 2017. Series 3 is shipping to stores now, with Jetpack Spider-Man and Squirrel Girl, Spider-Man Noir with Itsy-Bitsy Spider-Man, Captain America with Hyperion, and Ant-Man with the Falcon! Find your nearest store at Walgreens.com! James Saunders, a disgruntled chemist tired of his job with the Hudson Pharmaceutical Company of West Caldwell, New Jersey, was contacted by the Grandmaster and offered superhuman powers in exchange for joining a team that would compete on his behalf. Saunders agreed, and he created a formula based on information given to him by the Grandmaster and that granted him superhuman speed. Related Dork Side Toys links: Marvel Legends Speed Demon, All Marvel Legends, Newly Listed Marvel Legends Spider-Man Absorbing Man Wave Set of 8. These are due out later this month. SDCC 2015 – Hasbro Breakfast Marvel Legends – Spider-Gwen! At the Hasbro Breakfast during San Diego Comic-Con 2015, they revealed Marvel Legends 2016 Wave 1 – Spider-Man Wave. This includes our first Spider-Gwen figure and the new Beetle! A few more detailed images have been added. Enjoy!